This year I opted for a more indie take on the tired tradition of giving the obligatory dozen red roses for valentines day. Mrs. Rainforest Gardener and I both love roses and all, but the annual spectacle of a million desperate men dutifully standing in line and grudgingly forking over twice as much for sloppy seconds somehow cheapens the idea. 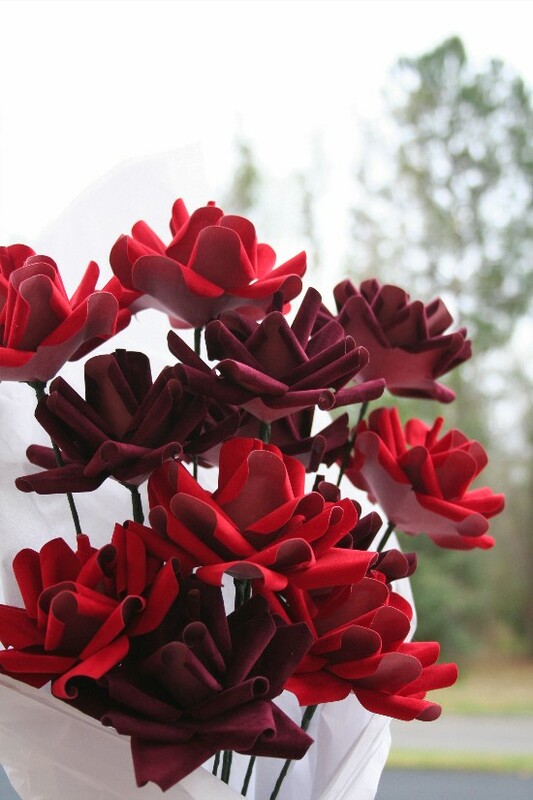 When I saw Julie Godzicki's paper roses on Facebook however, I sensed a revolution... or at least a great gift idea. 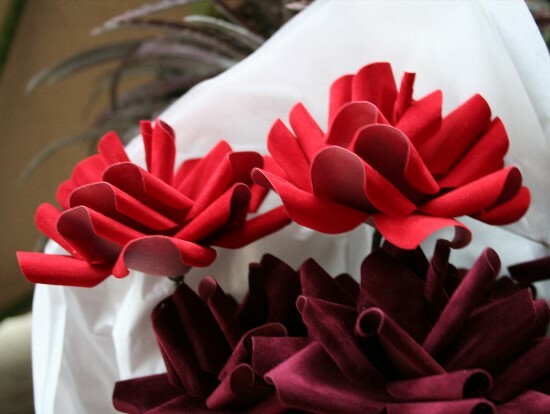 I can think of no better way to affordably show off your romantic individuality than to give handcrafted paper flowers that can be cherished for years. Thanks to Julie and a little help from my wife's sneaky coworker, I was able to surprise the love of my life at work with lunch, a bag of goodies and a dozen paper roses. Mrs. Rainforest Gardener loved them so much that she wants to permanently display them on her desk! Julie started making these paper flowers when she became a volunteer for her local Jacksonville, FL troop; first giving them to girls for their bridging ceremonies and eventually selling as many as 100 of them at a craft fair to benefit her troop. Between Julie’s day job, her scouts and the occasional night of sleep, she’s taking the time to turn her hobby into something bigger. Now she has her sights set on Etsy and has already started a Facebook page called Zicki Creates to get the word out about her product before she makes the jump. "I have always been crafty. I started hand-sewing Barbie doll clothes when I was a little girl until my mom let me start using a real sewing machine." Even as my coworker, Julie Godzicki (Zicki for short) has always made time to be creative. In addition to feeding us an endless supply of baked goods, paper was her specialty and the walls of our workplace were always covered with handcrafted motivational displays. "People are amazed at what can be done with paper"
One of those displays featured some Angry Birds that she crafted out of cut construction paper to make our ‘team building’ exercise more bearable. Upper management divided us into groups of Angry Birds to emphasize our individual strengths, but those of you who have actually played the game would understand the frustration of the poor saps in the Red Bird group. I mean, he does nothing but knock over a few blocks and go ‘ppffftt!’ in a puff of mediocrity. Julie’s beautiful construction paper rendition, however, was anything but mediocre. Strangers always do a double take upon first seeing her flowers when they realize that they're not real flowers, but meticulously crafted works of art - and made from something so readily available and taken for granted. "People are amazed what can be done with paper" she explains, telling me about the extra effort she puts into finding the right accessories and materials to really make her work stand out. I don't want to give away all of Julie's secrets so soon, but I will tell you how to get similar results. 1. Cut Paper - Cut paper into a five basic flower shapes, with five rounded petals. 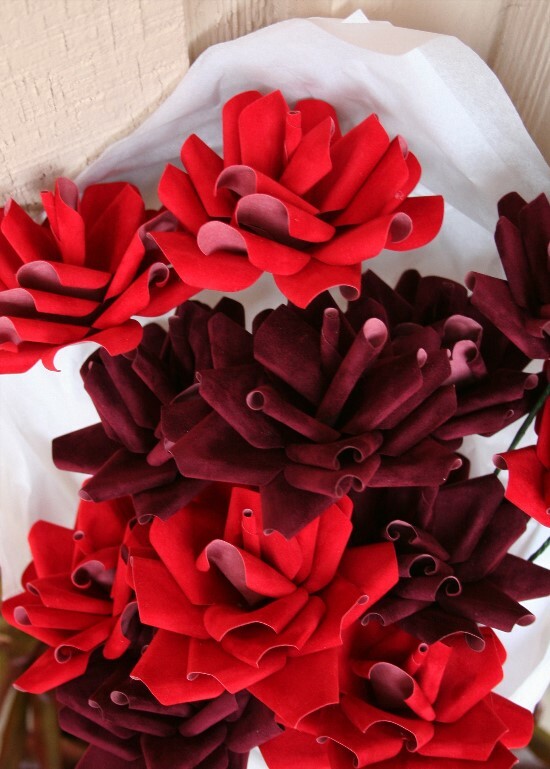 The roses pictured were made with velvet textured scrapbooking paper available from a crafting store. Cut one of the petals off of the last cutout, all the way to the middle as if you're slicing a pizza. Save both parts of the 'pizza' as these pieces will be used last. 2. 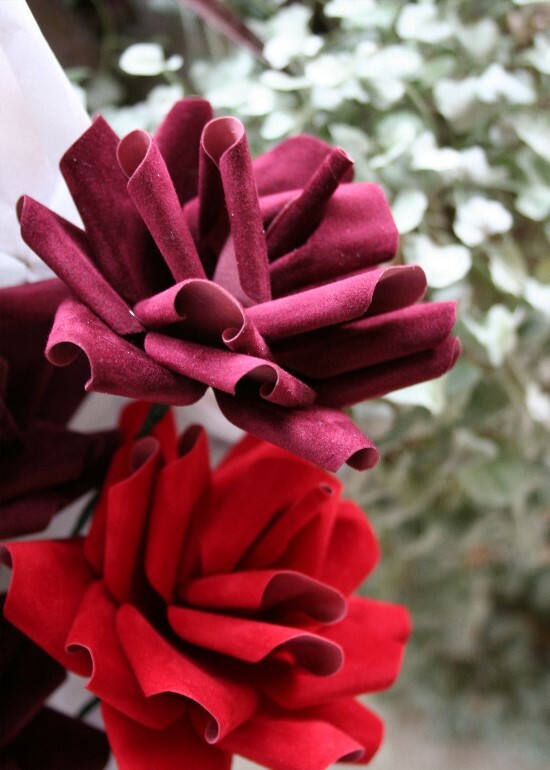 Quill Paper - The edges of each petal are 'quilled' - or rolled up - with a tool such as a pen or chopstick to attain their curly volume. Roll the paper under for a natural look. 3. Skewer - Punch florist wire through the center of the first 'flower' cutout, leaving about an inch of wire above. 4. Wrap Stem - The stem can be made by wrapping the wire with green florist tape, all the way up to the base of the first flower cutout. A hot glue gun may be used to secure the cutout in place. 5. Add Three Cutouts - Punch three additional flower cutouts through the wire, above the first cutout. 6. Add Last Cutout - Now add the cutout with four petals - the one with the missing 'pizza slice' - and firmly push down in the center so that it looks like a finished rose. 7. Finish Flower - Bend a small 'crook' in the wire to hold your place and cut off any excess wire above the bend. Now apply a bit of glue to the narrow end of the last petal (the pizza slice, remember?) and carefully place in the center so that it covers up the wire. I'm sure that Julie's own method is more specific than mine, but these instructions should give you something close to what you see in the photos. If you have any questions or would like to buy your own, let Julie know on her Facebook page Zicki Creates or leave a comment below! 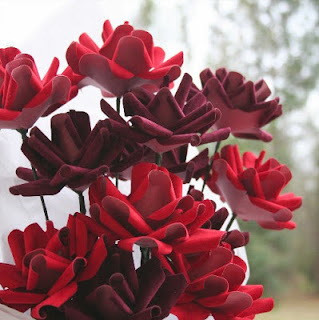 Reminds me of Marie Osmond singing "Paper Roses". Seriously, they are beautiful!! What a refreshing update to a tired tradition. Lucky wife you've got!